Hugh Farmer: I was recently contacted by Samantha Martin, granddaughter of the subject of this article Frank Gardner. Samantha said there were errors in the original article, shown below which was originally posted in November 2014. I am happy to correct those mistakes she notes and thought it best to start with her recent email and highlight the changes Samantha suggests which i have added to the original article. Samantha Martin(SM): “I just come across your article on my grandfather Frank Gardner and there are some inaccuracies in your piece. First – As my mother stated in the book, Toy Town, Frank was not born in Japan but was indeed born in Hong Kong as the birth certificate clearly states. Second- Frank Gardner retired as Managing Director of PMC in 1971 and appointed his son in law /my father Joel Martin as Managing Director to run PMC. The PMC building was sold in 1973 at which time the company closed. I and my mother would appreciate a correction to your piece. The original 2014 article: York Lo: With reference to the article Bosco Radio Corp, the Gardner brothers and Kyoei Corp.
Had the Gardners actually assembled the radios in HK they would have been the pioneers of HK radio industry instead of H.C. Woo of Atlas Electronics/Champagne in the 1950s. In any case, I believe Frank Gardner of Bosco Radio is the same individual as Frank Gardner the HK toy industry pioneer profiled in the book “Toy Town” written by Sarah Monks and published by HK Toys Manufacturers Association in 2010. The story as told by Frank’s daughter Angela in the book differs from the BAAG accounts – it said Frank was born in HK instead of Japan in 1920, although he did spend his childhood in Japan where his father was the Bolivian ambassador to Japan. (it is unclear what nationality the Gardners identify as – the book mentioned they are of European descent but have been in Asia since the 1840s with some Spanish and Macau Portugese blood mixed in). SM: As my mother stated in the book, Toy Town, Frank was not born in Japan but was indeed born in Hong Kong as the birth certificate clearly states. It also mentioned that Frank did not join his brother Bobby (presumably the RG Gardner in the BAAG report) at Bosco Radio until after the war while this BAAG report clearly shows that he was involved since Bosco’s inception in 1939. Anyhow, Frank’s greater contributions was in the toy industry where his firm PMC was one of the first HK firms to participate in the Nuremberg Toy Fair but sadly his business failed in the 1970s and he died of a heart attack in 1982 at the age of 61. SM: Frank Gardner retired as Managing Director of PMC in 1971 and appointed his son in law /my father Joel Martin as Managing Director to run PMC. The PMC building was sold in 1973 at which time the company closed. This article was first published 30th November 2014 and updated on 11th April 2018. Apologies for my typo in the first sentence of the comment – should H.T. Woo (Hsiao Tsing Woo) of Atlas Electronics instead of HC Woo – I will write about him later on. Managed to find some records of “Bosco Corporation” after the war which sheds more light on its post war activities. 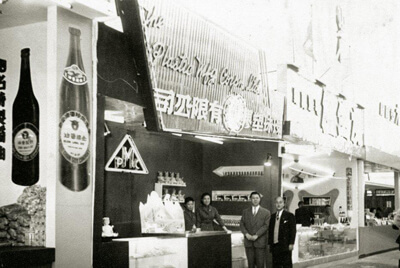 In the 1949 Business Directory of HK Canton and Macao, it listed its office at room 306 in Princes Building with RC Gardner as general manager and FD Gardner as manager and RC Tavares as assistant manager and 6 Chinese staff, The agencies the firm had included radios from Kolster Brandes (KB) from Sidcup, Kent, loudspeakers Celestion ltd from Ditton, Surrey, general food products from Intrex Export & Trading from Melbourne and Almor lamps from Alberts & Morel in Amsterdam. It also classified itself as a manufacturer in addition to being a trading firm so they could be assembling radios.